The restaurants of L'Ametlla de Mar, Alcanar, L'Ampolla and Sant Carles de la Ràpita offer menus featuring the mantis shrimp and local wines, including the renowned Terra Alta white grenache. The four seaside towns join to offer you the exquisite gastronomic menus in their restaurants with mantis shrimp, which is a typical local product of the Ebro Sea. This crustacean is grown in areas close to deltas where waters are rich in nutrients and it's an excellent source of high quality proteins, vitamins and minerals. Unlike other crustaceans, mantis shrimp is low in calories and easy to digest. 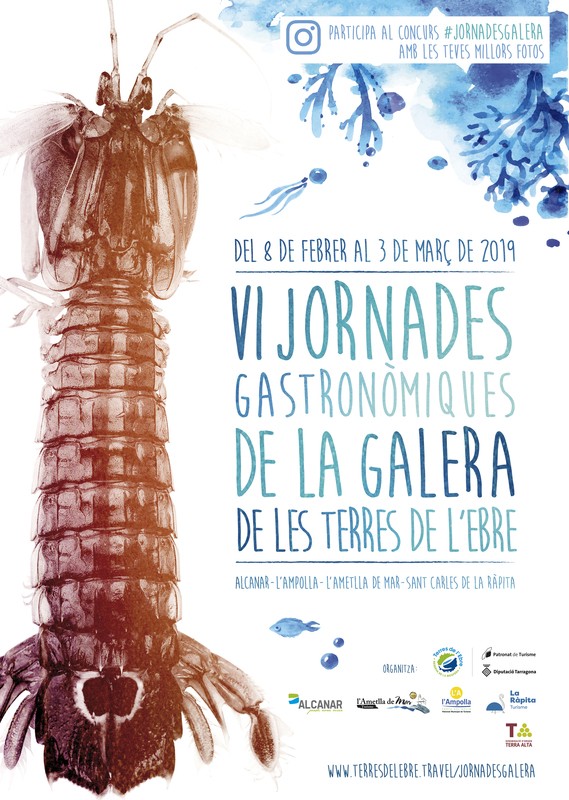 From February 8th to March 3rd, 2019 come to taste the mantis shrimp in Terres de l'Ebre! The restaurants in Alcanar, l'Ametlla de Mar, l'Ampolla and Sant Carles de la Ràpita have prepared a serie of delicious menus, with DO Terra Alta wines, where you can sample candied artichokes with poultry egg and "tempura" of mantis shrimp, "fideuada" with prawns and crayfish or monkfish on the cream of calçot and mantis shrimp.